Catholic Action formed in 2014 and quickly began making a name for themselves with their memorable and characterful songwriting. Chris McCrory, is already an influential producer in his own right despite his young age - having already worked alongside Siobhan Wilson, Kelora, Breakfast Muff, Palm Honey and more. 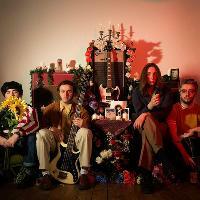 Co-Producing their debut album along with Margo Broom (Fat White Family, Goat Girl, Dead Pretties), "In Memory Of" has received critical acclaim and their first two singles have gained incredible support from the likes of BBC Radio 1 - launching the band to slots at SXSW and BBC Radio 1&apos;s big Weekend. Catholic Action are fast gaining a reputation as a formidable live act, having already shared stages with the likes of Franz Ferdinand, Sparks, Teenage Fanclub, The Libertines and Swim Deep. Here are the latest Catholic Action mixes uploaded to Soundcloud. Do you promote/manage Catholic Action? Login to our free Promotion Centre to update these details.